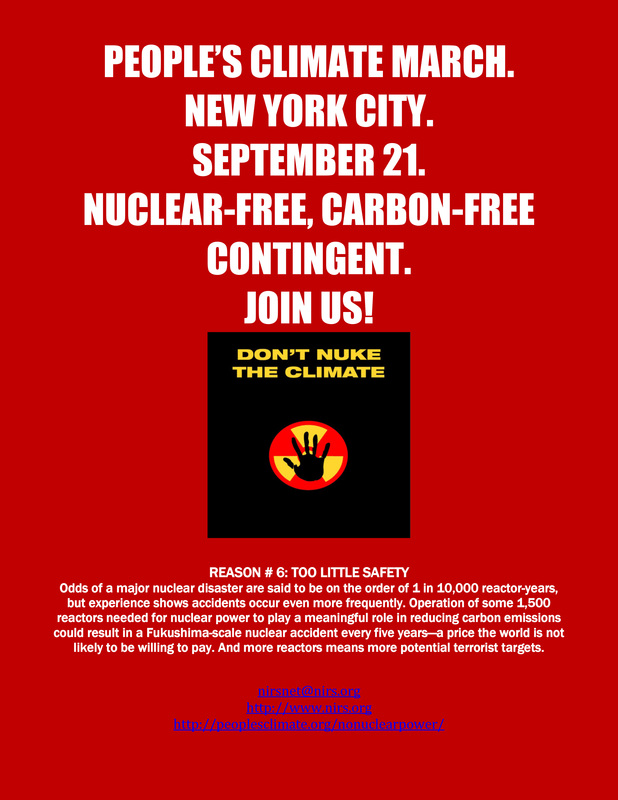 THANK YOU to the 400,000 who marched in New York City on Sunday and especially to the many thousands who joined and marched with the Nuclear-Free, Carbon-Free Contingent! And THANK YOU to the 60+ grassroots activists from New York to California who joined in Saturday’s strategy session. We got a lot done and you will be hearing from us soon. 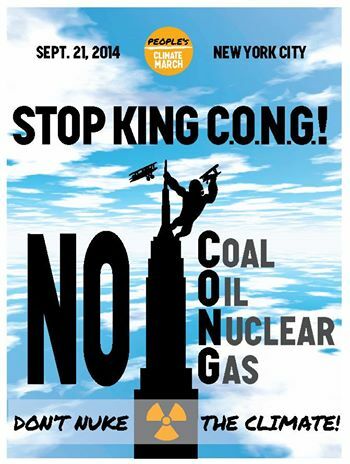 And THANK YOU to all the inspiring speakers and performers at the Nuclear-Free, Carbon-Free rally. Everything worked. The People’s Climate March wasn’t just a one-day event: it was the beginning of a new, more unified and ongoing movement. Here is the first next step: Take Action:Tell EPA to take nuclear support out of its carbon rules. Our take on the March: We made history; now the real work starts. GreenWorld, September 23, 2014. PHOTO GALLERY: 261 photos of the Nuclear-Free, Carbon-Free Contingent at the People’s Climate March. From the strategy meeting on Saturday, September 20, to the early morning preparations at the site, to the rally speakers and the march itself, this gallery documents this historic weekend. 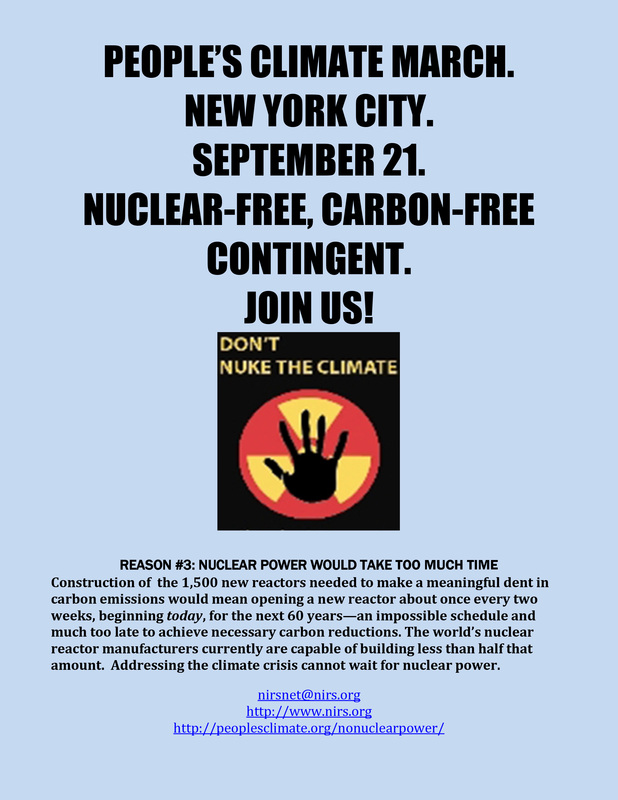 VIDEO: Video of the entire Nuclear-Free, Carbon-Free Contingent rally, by speaker/performer, is now available. The video was done on a volunteer basis by independent videographer Art Egerton of Vermont. We encourage you to support this effort on his Go Fund Me page here. Video of the march itself will be available soon. ASSEMBLE: Central Park West between 73rd and 74th streets. 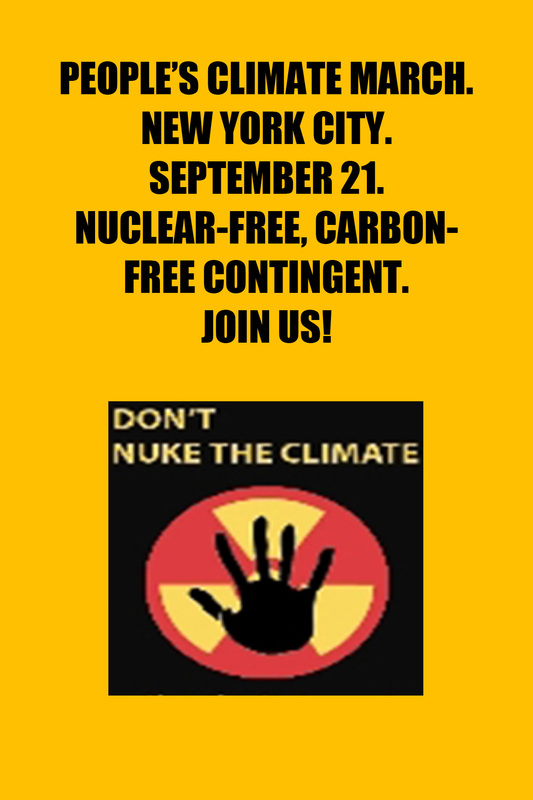 Nuclear-Free, Carbon-Free Contingent rally begins at 10 am. Confirmed speakers: Dr. Arjun Makhijani (IEER and author of Carbon-Free, Nuclear-Free); Hunter Lovins, President and Founder of Natural Capitalism Solutions, one of the nation’s leading experts in sustainable energy practices; Jessica Azulay, Program Director, Alliance for a Green Economy (AGREE); Julia Walsh (Campaign Director, Frack Action & New Yorkers Against Fracking); Tim Judson (NIRS); Leona Morgan, Dine No Nukes in New Mexico; Japanese activist Yuko Tonohira; Sandra Steingraber, Concerned Health Professionals of New York, Distinguished Scholar at Ithaca College; new poems by Marge Piercy; Michael Mariotte, MC (NIRS). Press Release on Sunday Rally. DIRECTIONS: By subway: 1, 2 and 3 lines and C lines, 72nd Street stop.For those coming from downtown, take the C to 72nd or the 1,2, or 3 to 72nd. For those coming from uptown (north of the park), take the 1,2, or 3 lines downtown to 72nd; or take the A,C,D downtown to Columbus Circle, and then the C uptown to 72nd. (the C train from uptown is an express train and doesn’t stop at 72nd street, thus the need to get off at Columbus Circle and get on the C train from downtown). (Note, this corrects an earlier post on subway access to the assembly site). Those coming by bus will be dropped off around 86th Street and Central Park West. The best alternative is probably just to walk down to 73rd Street–it’s about 3/4 of a mile. – Assemble at Central Park West between 73rd and 74th streets. 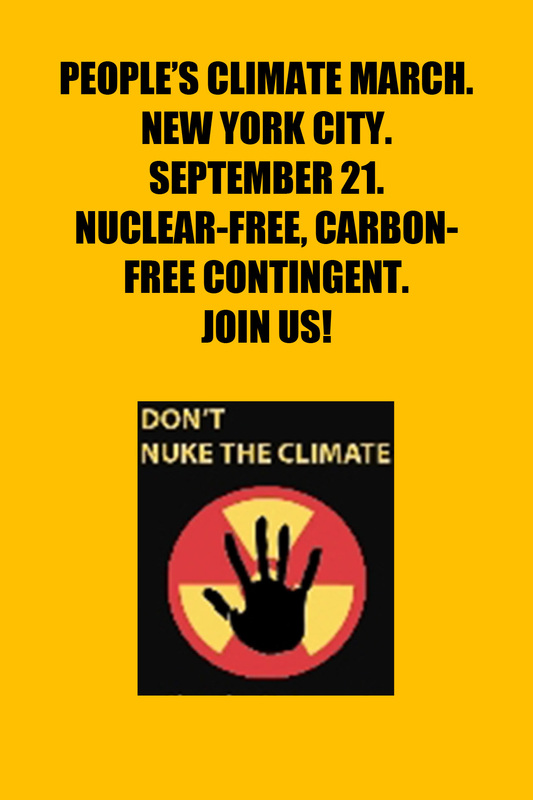 This block has been designated for the Nuclear-Free, Carbon-Free Contingent rally. From there we will march to Columbus Circle. The March itself will begin at 11:30 am. 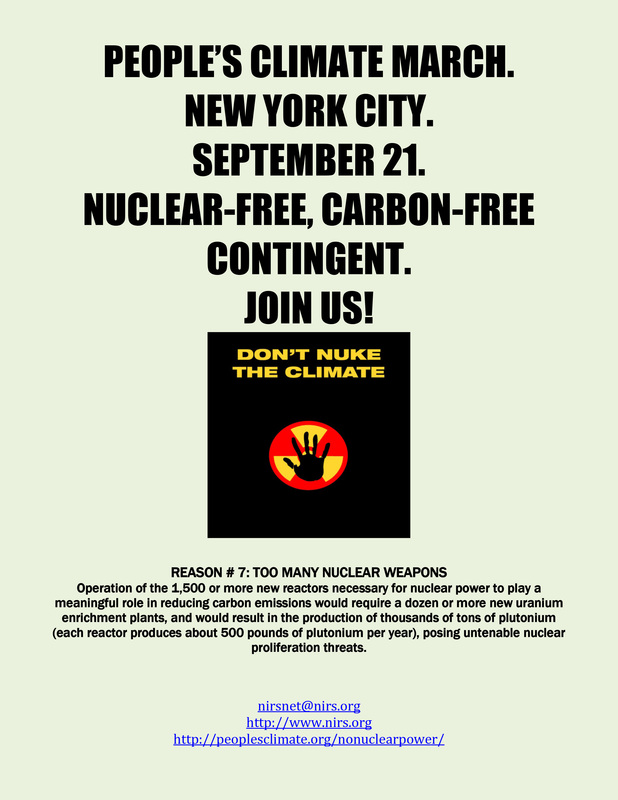 National meeting of Nuclear-Free, Carbon-Free activists Saturday afternoon, September 20, 2014, in NYC. This will take place from 2-6 pm at the Bread and Butter Deli, upstairs, 419 Park Avenue South (corner of 29th Street). #6 subway, 28th Street stop. Visualizing the Climate March (and the Nuclear-Free, Carbon-Free Contingent). GreenWorld, August 29, 2014. A quick guide to what the march and Contingent just might look, sound, and feel like. Why We Are Marching: Statement of the Nuclear-Free, Carbon-Free Contingent; pdf version for downloading/printing. Endorsers of Nuclear-Free, Carbon-Free Contingent. More than 135 organizations have endorsed the Contingent! To endorse, send your name, organization name, city, state, country (if outside U.S.) to nirs@nirs.org. 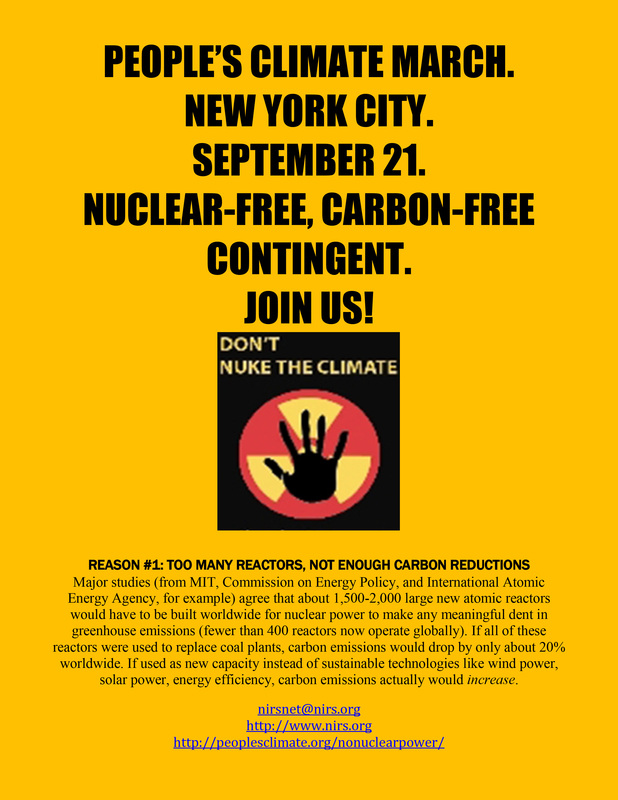 Individuals: Endorse the Nuclear-Free, Carbon-Free Contingent here. 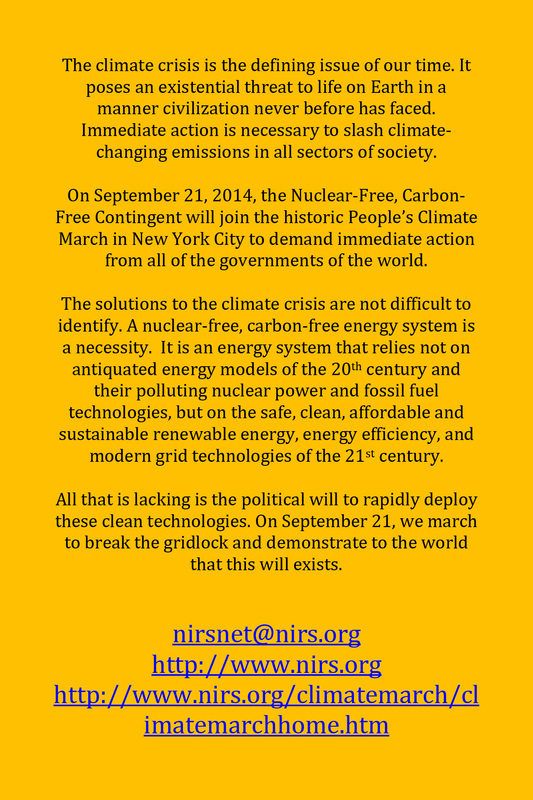 Press release announcing Nuclear-Free, Carbon-Free Contingent, August 4, 2014. pdf. How to make turnout calls for the People’s Climate March. A how-to guide for the most effective means of increasing turnout. Grassroots organizing conference calls every other Tuesday at 8 pm eastern time. Next (and final) call: Wednesday, September 17, 2014. Contact nirs@nirs.org for call information. 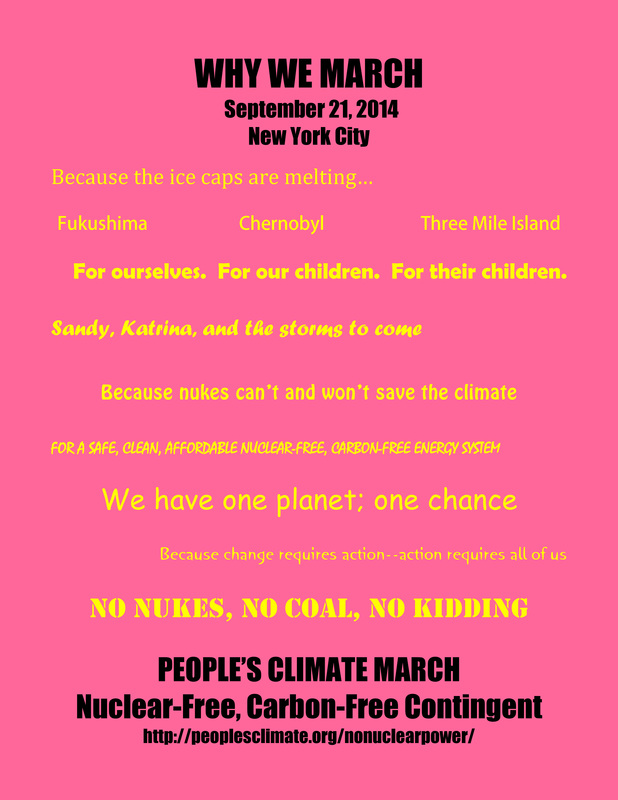 People’s Climate March transportation page. Buses, trains and car caravans are listed here from various parts of the country. The page is being updated just about daily with new buses listed. Become a Bus Captain! NIRS and the People’s Climate March (PCM) both encourage every organization working to bring people to the march to appoint a Bus Captain who will be in charge of arranging transportation to NYC. 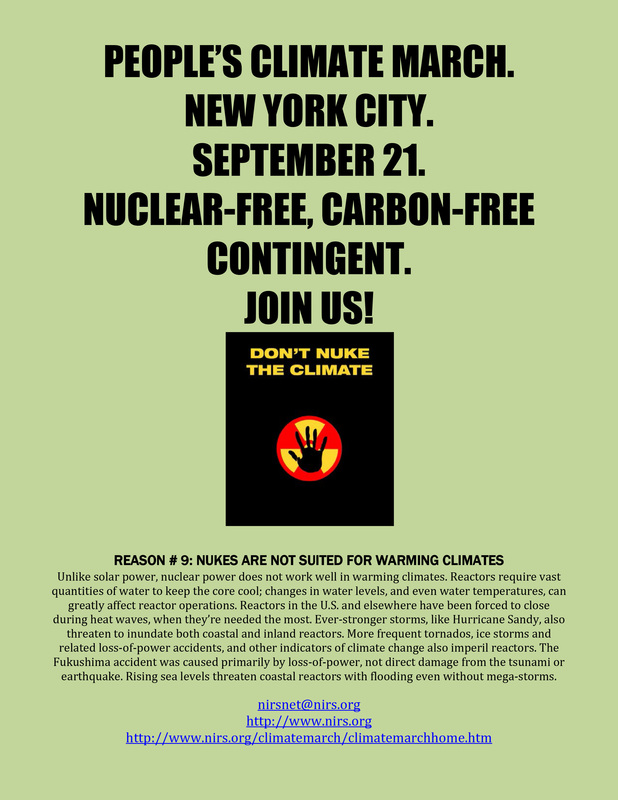 We encourage Nuclear-Free, Carbon-Free Contingent groups to arrange their own buses: if you do so, send a message to us at nirs@nirs.org and we will contact people in your region and work to help you fill the buses. Here is a Bus Captain information/organizing Toolkit prepared by PCM. Postcard Flyer. Side one: pdf version. jpg version. doc version. Side two: pdf version. jpg version. doc version. Both sides in one file: pdf version. jpg version. doc version. Flyer: Why We March. pdf version. jpg version. 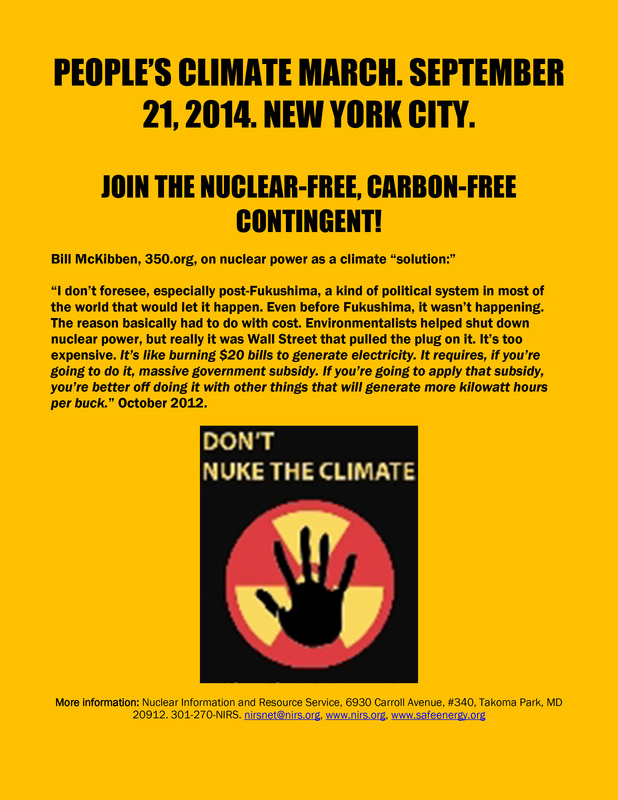 Flyer: 350.org’s Bill McKibben on why nuclear power won’t be a climate solution. pdf version. jpg version. 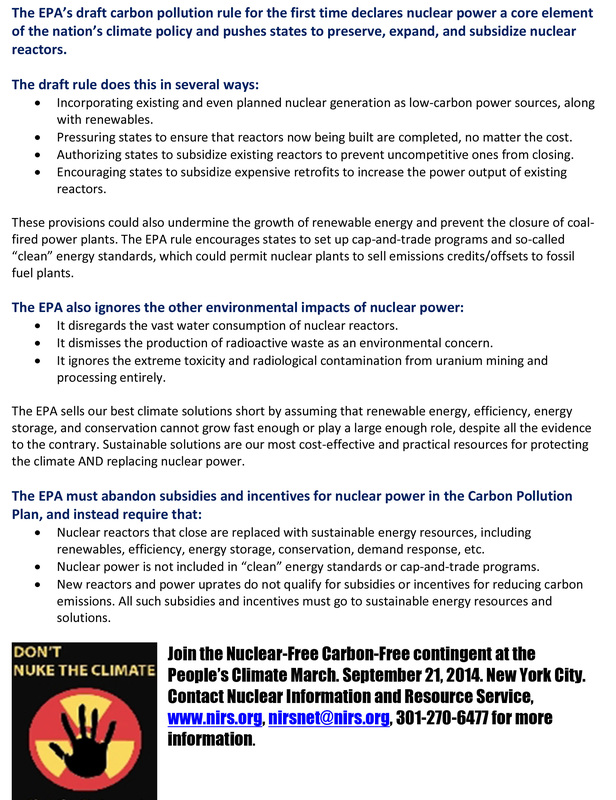 Flyer: Talking Points on nuclear power in EPA’s proposed carbon reduction rule. pdf version. jpg version. EPA’s proposed carbon rules provide subsidies to uneconomic, aging, dangerous nuclear reactors. NIRS press release. Reason #1. Too Many Reactors, Not Enough Carbon Reductions pdf version(best for downloading and printing). jpg version (best for posting online). Word version (take out NIRS contact info and add your group’s info). Reason #2. Nuclear power costs too much. pdf version (best for downloading and printing). jpg version (best for posting online). Word version (take out NIRS contact info and add your group’s info). Reason #3. Nuclear Power would take too long. pdf version (best for downloading and printing). jpg version (best for posting online). Word version (take out NIRS contact info and add your group’s info). Reason #4. New Reactor Designs: Too Slow, No Demand. pdf version (best for downloading and printing). jpg version (best for posting online). Word version (take out NIRS contact info and add your group’s info). Reason #5. Too Much Radioactive Waste. pdf version (best for downloading and printing). jpg version (best for posting online). Word version (take out NIRS contact info and add your group’s info). Reason #6. Too Little Safety. pdf version (best for downloading and printing). jpg version (best for posting online). Word version (take out NIRS contact info and add your group’s info). Reason #7. Too Many Nuclear Weapons. pdf version (best for downloading and printing). jpg version (best for posting online). Word version (take out NIRS contact info and add your group’s info). Reason #8. Nukes are not carbon-free. pdf version (best for downloading and printing). jpg version (best for posting online). Word version (take out NIRS contact info and add your group’s info). Reason #9 Nukes are not suited for warming climates. pdf version (best for downloading and printing). jpg version (best for posting online). Word version (take out NIRS contact info and add your group’s info). Reason #10 A Nuclear-Free, Carbon-Free energy system is safer, cleaner, cheaper and faster at reducing carbon emissions. pdf version (best for downloading and printing). jpg version (best for posting online). Word version (take out NIRS contact info and add your group’s info). Killing the Competition. The Nuclear Power Agenda to block climate action, stop renewable energy, and subsidize old reactors. Major new report by NIRS’ Executive Director Tim Judson details how major utilities and nuclear power companies have begun a campaign to rig energy markets, climate regulations, and clean energy programs to prevent the advance of renewable energy. 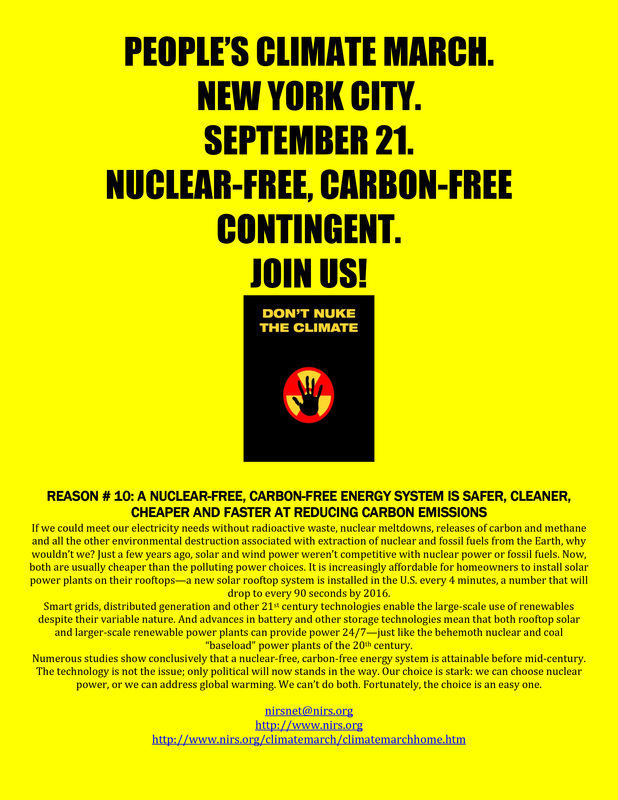 Using a deceptive public relations campaign and heavily-funded front groups like Nuclear Matters, Third Way, and C2ES, corporations including Exelon and Entergy have tried to drum up fears of a national energy crisis stemming from the closure of several aging, uncompetitive nuclear plants and the advance of renewable energy. While touting the need to “preserve” nuclear power, nuclear interests have covered up the actual reforms they are seeking and their implications for the U.S.’s energy future. Nuclear-Free, Carbon-Free: Links to studies showing different pathways to a nuclear-free, carbon-free energy system by mid-century–if not sooner. We’re going all out for the People’s Climate March. NIRS’ Michael Mariotte on DailyKos, August 22, 2014. If not nuclear power, what? NIRS’ Michael Mariotte on DailyKos, June 27, 2012. Top 10 Reasons Nuclear Power Won’t Save the Climate. NIRS’ Michael Mariotte on DailyKos, August 18, 2009 (and still valid).